Fishing Lost Creek Reservoir is a magnificent experience. Lost Creek is a quiet, secluded reservoir located in Morgan County and is easily accessed from I-84. Shoreline fishing is available from the south end of Lost Creek (near the dam) and around to the boat ramp that is located on the east arm of the reservoir. The boat ramp is small, but it's perfect for small fishing boats and float tubers. The reservoir is managed for fishing and has a wakeless-speed-only regulation. The regulation means you won't have to compete with water skiers or jet skis as you troll around the reservoir, enjoying the scenery and the fishing. After May 31, it will stay open until 10 p.m.
Powerbait and worms work well for trout here, but anglers who use lures often find the most success. When fishing from a boat, trolling a lure that imitates a fish, such as flat fish and especially Rapalas, seems to work best. Some of the best Rapala colors to use include gold, silver and silver fluorescent chartreuse in F-5 (2 inches). Trolling pop gear and worms also works well. From shore, reports coming in from anglers indicate Mepps spinners and Jake's Spin-a-Lures have been working really well lately. As the weather warms and the bugs start to fly, using a spinning rod and reel to cast a fly behind a bubble can also be very effective. Fly patterns that have worked well in the past include renegades, Adams, mosquitoes, coachman's and gray hackle yellow. This quiet, secluded reservoir is in Morgan County and is easily accessed off of I-84. The reservoir is only a one-hour drive from most of the Wasatch Front. 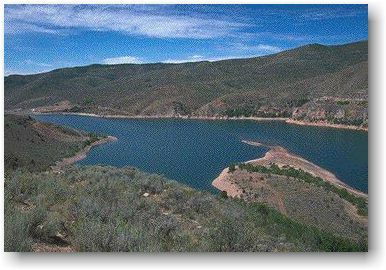 Anglers from the Ogden area can access the reservoir from I-84. Salt Lake City anglers can access the reservoir by traveling east on I-80, turning onto I-84 at Echo Junction and then heading west on I-84. No matter which area you come from, take the Croydon exit off of I-84 at the Devil's Slide area in Weber Canyon. Travel through the small town of Croydon and head north 10 miles up the canyon to the reservoir.